This is www.MarshaMcCloskey.com. Feathered Star Productions, Inc. features quilts and quilting products by designer, Marsha McCloskey: Feathered Star books and patterns, and her Fabric Collections from Clothworks Fabrics. Featured are Marsha's specialty rotary cutting rulers, including Judy Hopkins' ScrapMaster-Plus. Recently added is the Cascadia Map by David McCloskey. Thanks for visiting. The new Block of the Month pattern to go with my Wintertide line of red and green prints from Clothworks will be ready November 1. This pattern will be offered to quilt shops for the calendar year of 2019. Wholesale customers, click here for more information. LOVE this red and white version of the Star of Chamblie Sampler! 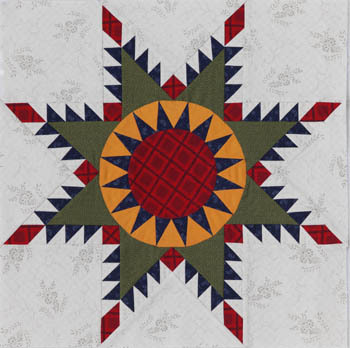 Marsha's online Feathered Star course with Craft University is now found at The Quilting Company! Click here to learn all about it and sign up! French Connections, the newest fabric line from Marsha McCloskey and Clothworks Fabrics, is here. Wow. See the French Connections fabric line here! Marsha's Berry Blue quilt pattern is in the March/April Issue of Love of Quilting magazine. See the Blueberry Buckle fabric line here! Perfect Piecing is within your reach! USPS Postage prices went up in January. We ship by US Priority Mail. When you place an order here, your shipping cost is automatically estimated and added to your total. Shipping estimates within the United States are: $7.75 for 1 item, $9.50 for 2 items, $11.50 for 3 items, $13.50 for 4 or more items. Don't let these numbers scare you: if your items can be shipped for less (usually $6.95), i.e., they all fit safely in one Flat Rate Priority Mailer, you will only be charged the smaller amount. Some single patterns and rulers can be sent First Class in a smaller envelope for $3.00 or $4.00. If your order can be shipped for less than what is calculated on the order form, it will be, and you will be charged the smaller amount. First Class rates can be cheaper, but slower. If you want First Class instead of Priority, write it in the space for comments. International shipping charges vary. Your shipping will be charged at actual cost beginning at $24.55 (estimated) for Canada and $33.85 (estimated) for any other country. These prices apply to orders that will fit into a Flat Rate Priority Envelope or Flat Rate Priority Padded Mailer. If your order will not fit in the Flat Rate envelope, you will be contacted by email with the new shipping charges for your approval before the order is shipped. First Class International is usually cheaper, but slower. If you want First Class instead of Priority, write it in the space for comments. I�ve been having trouble with my old system of processing charge cards for the website. So for now, I�ve gone with Paypal for online orders. Checkout is now showing a GUEST CHECKOUT. You can just enter your credit card information and Paypal will process the payment. You don�t have to open a Paypal Account to make a purchase. If you prefer, I can take your credit card information over the phone and run it through the Square. Just let me know by email when it would be convenient for me to call you for the information. I'm on Facebook! If you want to join the quilting conversation, please click the "thumbs up-LIKE" icon. Hope to "see" you there! Make good quilts. Take care of yourselves and the ones you love. Write when you find out how it works. If you would like to receive my FREE newsletter for quilters, e-mail me at mccloskey1@aol.com and I'll put you on the list, or go directly to Yahoo!Groups and sign up at MarshaMcCloskeyNewsletter-subscribe@yahoogroups.com.